A spicy, green curry pork stir fry with carrots, broccoli and spring onions, flavoured with coconut milk and served on a bed of cauliflower "rice". Fill a saucepan (about a ⅓ full) with water and place on the stove to bring to the boil. Place the grated cauliflower in a sieve on top of the saucepan - without touching the water. Let the cauliflower steam for about 10 minutes until cooked. Remove and keep warm. Mix the following ingredients in a bowl: garlic, coriander and green curry paste. Set aside. Add the chicken stock granules to the boiling water and stir until dissolved. Set aside. Heat a little vegetable oil (enough to coat the pan) in a frying pan on medium to high heat. Add the curry mixture and stir fry for a minute. Now add the pork and stir fry for 5 minutes or until the meat is cooked through. Add the carrots and broccoli and stir fry for 3 minutes. Then add the spring onions and stir fry for another minute. Now add the oyster sauce, fish sauce, chicken stock and coconut milk. Stir for another 2 or three minutes until heated through. Finally add the basil leaves and mix through. 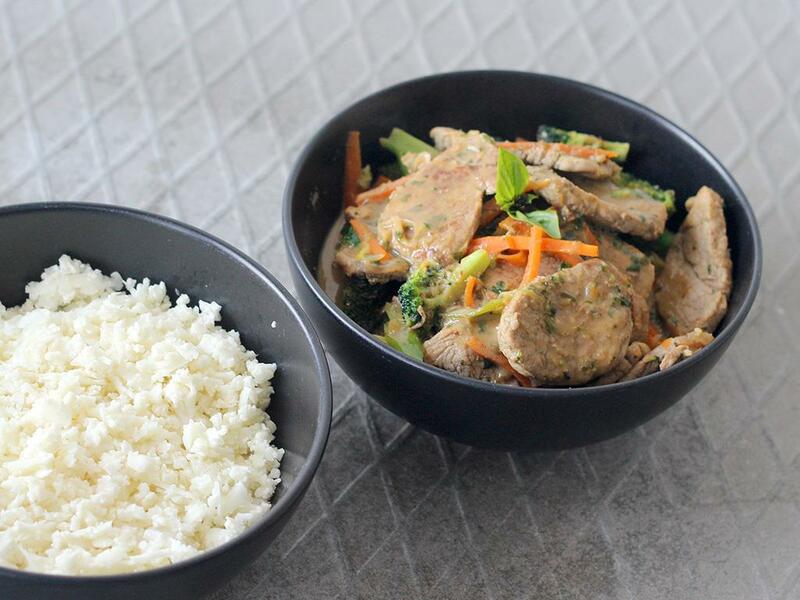 To serve, the cauliflower “rice” topped with the pork stir fry.